Detection dogs are used in a wide range of fields, in the private or business sphere, through to police or military use. At the Roblezal Canine Centre, we specialise in the training from scratch of detection and tracking dogs. The best-known types of detection dogs are used for drugs, explosives, living people, dead bodies and banknotes. They generally belong to police or military canine units. However, the possibilities offered by a detection dog are virtually limitless as, wherever any kind of odour needs to be tracked and detected, a detection dog can be used. These include industrial applications to detect imperceptible leaks of gases or liquids; identifying fungi in the wood industry or detecting accelerants used in fires to help the police and insurance companies with their investigations. Specific applications for dogs trained to detect mushrooms, fungi or truffles, etc. Due to the wide range of possible applications, our clients must indicate the type of detection dog they want, so that we can train one or more dogs for this specific purpose. -Drug detection dogs for security firms or for foreign countries which require large numbers of drug detection dogs. Drug detection dogs for sale (Consult). -Explosive detection dogs for security firms, or for foreign countries which require large numbers of explosive detection dogs. Explosive detection dogs for sale (Consult). -Blood detection dogs, for blood tests associated with crimes. -Accelerant detection dogs, for property and equipment insurance companies. -Fungus detection dogs, for wood storage companies, where it is impossible to verify externally if the wood is in good condition. -Fungi or truffle detection dogs for private clients, individuals or companies dedicated to gathering them. Dogs trained to detect Boletus Edulis and truffles are among the most widely demanded. -Dogs trained to detect leaks of liquids or gases, for companies where controlling leaks of this kind is essential for its own safety or to protect the environment. -Dogs trained to detect high or low concentrations of specific chemicals, for quality assurance companies or companies that subcontract the manufacture of products based on specific compositions. -Poison detection dogs for police units responsible for identifying poisoned traps. 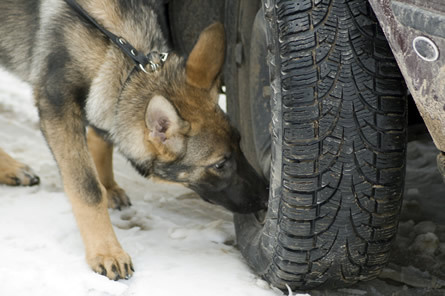 -Human Remain Detection (HRD) Dogs, not only for police units, but also for insurance companies and private detectives. HRD Dogs for sale (Consult). -Dogs trained to detect insect infestations, for pest control companies, to reduce inspection times. Other cutting-edge applications for these types of dogs that are less well known are detection dogs used for certain types of tumours or illnesses, which are already being used with great success in a number of hospitals. In terms of the breeds of dogs that can be used for detection purposes, many different breeds can be used, and so other aspects are taken into account, such as the size of the dog and how easy it is to handle, depending on the client’s needs in terms of space, transportation, etc. On many occasions, clients are unaware and cannot even imagine that a detection dog can save them or make them thousands of euros in profits. For this reason we encourage them to clear up any questions or doubts they may have about the services provided by these types of dogs, if there is a possibility of training dogs for their requirements. If you belong to a military, police or civil detection dog unit, used for the detection of people, drugs, explosives, HRD, etc., and you have any kind of one-off or recurrent problems during real operations or in training and do not know how to solve them, then contact us; we are specialists in restructuring training and daily routines, in order to solve these problems. Contact us for further information without commitment.